When you’re a fresh grad, you get fooled easily. Why? Simply because you have no experience, and you think that whatever is uttered by your idols is God sent, and therefore you must abide by it religiously. To tell you the truth, I never really liked translating a sample text as a free test for a client. I never really fell for it, either. I must admit, I was lucky in that I didn’t have to learn the hard way. I’ve been blessed with the best of clients from Day 1, except for the very few backstabbing colleagues (no free tests, just RIDICULOUSLY LOW rates, but that’s another story for another day). There are test takers and test givers. I’ve been in both positions, and believe me when I say real translation does not always work like that. Below I will prove my point in a very detailed way. Reminder: This is my personal opinion, based on personal experience and stories heard from way too many fellow translators. How many times have you not heard back from that potential client? What guarantees do you have that you will actually be given that project? How many times have you found yourself having to translate a couple of pages, or several different paragraphs of different subjects, as a free test? No, it’s not a coincidence that you and a bunch of your colleagues all have free tests to take from the same client, only it’s not the same page to translate. Each one of you is working on a different page of the same subject. You think that’s mean and no one would actually do that? Think again. We live in a world hungry for the buck where some people don’t care about coherence, cohesion or quality for that matter. All they care about is getting the job done with the lowest cost possible, even if it means defrauding other people in the process. Now let’s get to the bottom of it. What guarantees do you have that the translation quality will remain the same after the test is submitted and the job is approved? How many times have you found that the translation quality is not the same as the one of the test? How many times did you find yourself having to reassign the job to another translator because a simple editing simply won’t cut it (the translation is THAT bad)? How many deadlines have you missed because the translation had to be done all over again? How many times did you go over budget because you trusted the test, the translation proved to be poor and you had to pay twice for the same job? Oh, and please ask yourself this question: If you have good intentions and you are after the best quality translation there is, believing that a test is the best way to decide which translator suits your needs the most, did you really think that a well established, highly skillful and seasoned translator with years and years of experience would easily accept to do a free test for you? Food for thought. You’re welcome. Anyway, I established my business very shortly after graduating, and this is the main reason why I did not really take any tests. In fact, I was the one giving out the tests. To tell you the truth, it worked out well a few times. 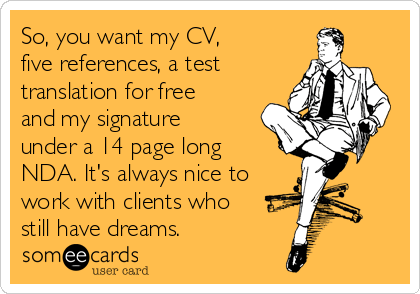 However, many many times I was really disappointed and shocked after assigning jobs based on an amazing test translation and then having to redo the work myself, because there was no time for me to risk losing the client by looking for another translator. I hear similar stories all the time, the most recent of which being just a couple of days ago from my dear friend, past classmate and colleague who had to go through the same ordeal because the test translation was nowhere near the awful outcome of the project which had a very tight deadline! I wouldn’t have wanted to be in her shoes, to be honest. I’ve had my fair share of disappointments and frustration. For all of the above reasons, I no longer believe in free translation tests. Paid translation tests make the translator work a little harder to ensure they actually secure the project. They are a guarantee for both client and translator. I would call it a win-win situation. On a personal note, I will no longer give free translation tests. On the other hand, I will also no longer hire fresh grads. Not that I have anything against them, as I am sure some of them are more qualified than many established translators, but, throughout past experiences, I weighed my wins and losses and compared fresh grads to experienced translators, and I’d go with the latter every time. Dear colleague, please think twice before accepting to take a free test. At least ask for a right of reply from your potential clients. TransTip: you can always offer to send them sample translations from your past work. It worked with me every single time! Dear client, please consider the potential loss you will be bearing by trusting a free test. Can your business afford it? Word of advice: translation is an act that requires maximum amounts of concentration, research and accuracy, with a high level of proficiency, and years of vast experience. What might seem like a simple page to you actually requires at least an hour of work. You cannot trust that a translator you do not know personally will actually invest their time in a free job. Let’s be real, not all people are honest! There are many scammers in every field of business, and translation is one of them!